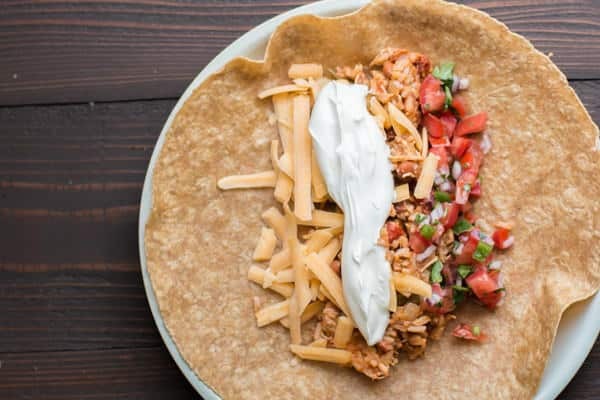 This Slow Cooker One Pot Chicken Burrito Filling is the easiest dinner ever! You won’t believe how easy this meal is. One pot meals are a must if you are tired of cooking, or are short on time. I’ve too often made burritos for dinner and had 3 different pots going, one for the meat, one for beans and one for the rice. 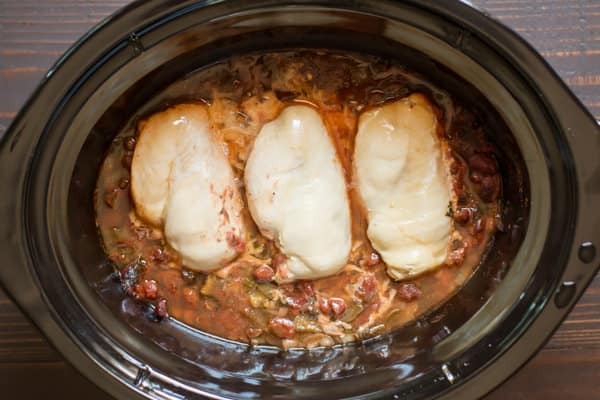 Not for this recipe, everything get cooked in one pot and no pre-browning the chicken! Below is the chicken, salsa, beans, onion, bell pepper and seasonings. DO NOT add the rice at this point. After the cooking time is done I add uncooked Minute® rice to the chicken and sauce. 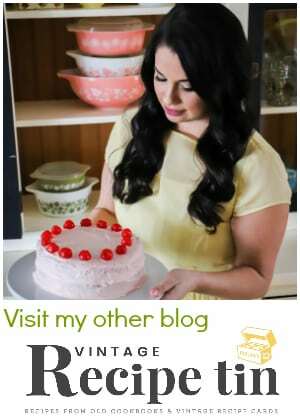 You will find in my blog I do not recommend standard rice in the slow cooker. Standard rice likes a lot of heat, hotter than what the slow cooker can produce, and will turn out gummy in the slow cooker. This is what it looks like after cooking. I then shred the chicken and add uncooked Minute rice®, then cook for 20 more minutes. 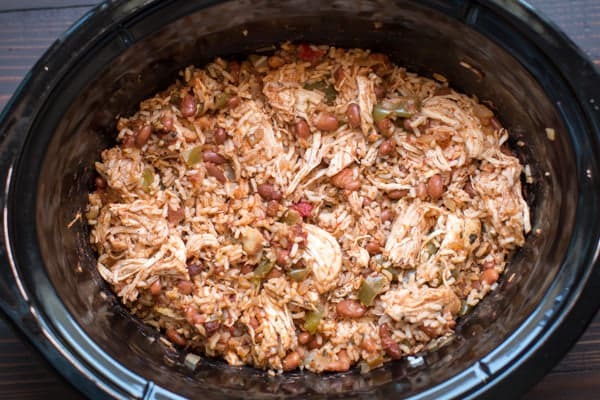 Below is my video about how to make this slow cooker one pot chicken burrito filling. You can follow me on YouTube, here. This is my kind of recipe, a no fuss easy dinner. I hope you give it a try! Have a great weekend! Add the onion, bell pepper, pinto beans, cilantro, salt, pepper, cumin, chili powder, and salsa. 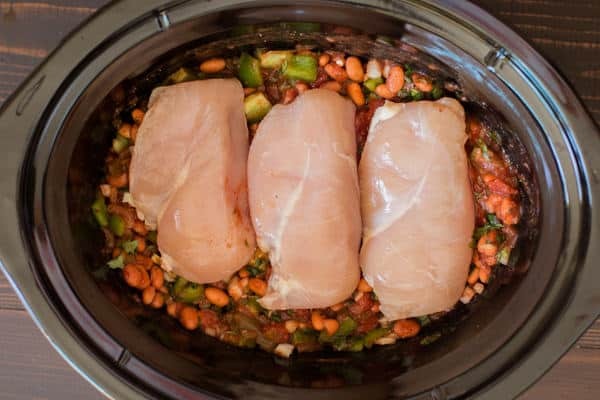 Add the chicken breasts. DO NOT ADD RICE YET! When the cooking time is done, shred the chicken with 2 forks. Add the minute rice and stir. Cover again. 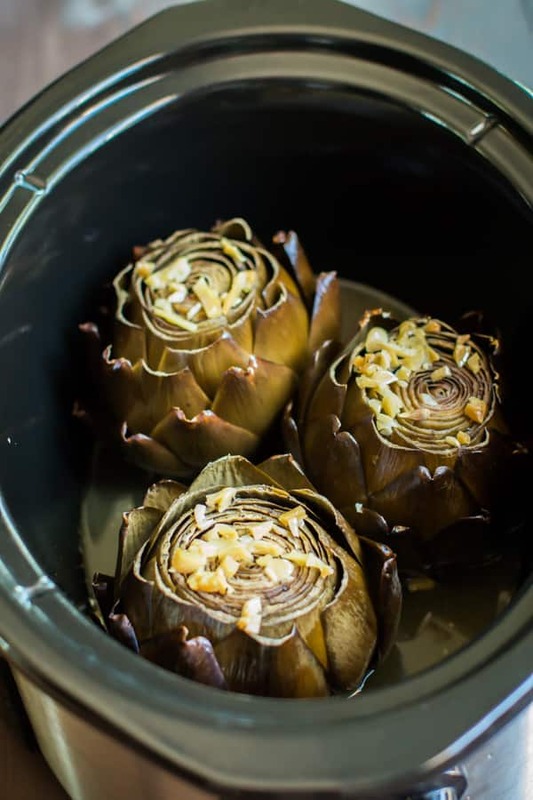 Turn the slow cooker onto high and cook for 20 minutes more. 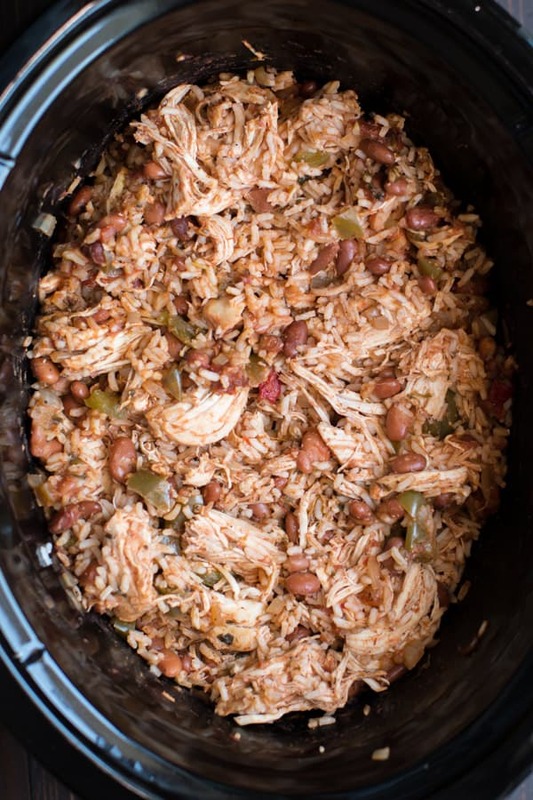 If your slow cooker had switched to the warm setting while you were gone during the day, you may need to cook the rice longer. Serve on tortillas with desired toppings. 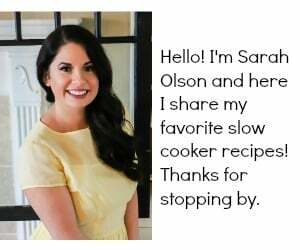 I used my touch-screen 6.5 quart Crock-pot® for this recipe though any slow cooker 5 quarts or larger will work fine. 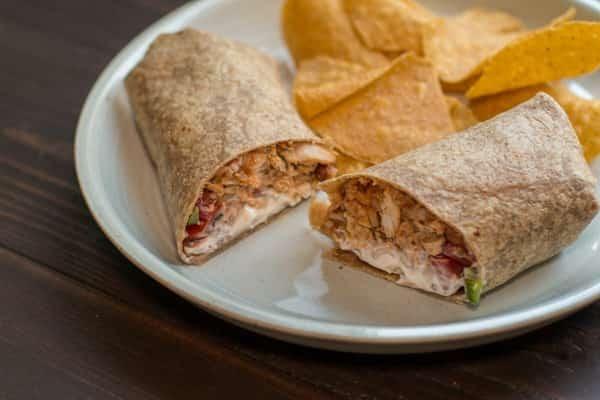 Do you think you can freeze the chicken burrito mixture? Would make way too much for my husband and I.
Pam I think it would freeze fine! Rice, beans and chicken do fine in the freezer for me. 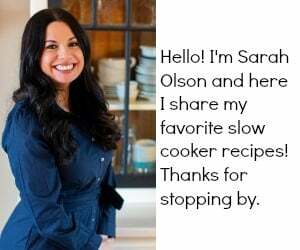 Hi Sarah, how can I adapt the recipe to use the leftover as a pie filling? It is way too much for a single person. Many thanks. How many does this serve serve? It makes about 8-10 good sized burritos. I think it would feed eight or more. I totally misread the timing on this when I first watched. 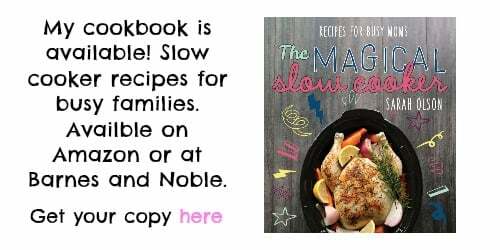 I just put everything in the slow cooker. Is it possible to Cooke the breasts on high for a few hours before adding the rice? Yes, that would work fine! Do you use a wet salsa in the crock pot, or more of a chunky pico de gallo? I don’t want it to turn out too liquidy since I plan on making them ahead and reheating later. I use a wetter salsa. 🙂 The Newmans is near the La Victoria salsa. If I substitute the chicken for steak, do I need to cook longer? The same time will work unless you need it to cook for a longer time, it should do fine longer too.